The Events industry is burgeoning and there is no scarcity of opportunities in this segment. 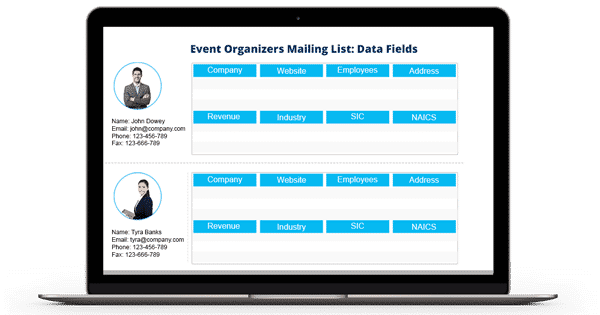 If you have products, solutions and services that support the organizations, professionals, and decision makers in the events industry, or you wish to organize events, Blue Mail Media’s Event Organizers Email Database can be your strategic resource. Being in the database business for years, Blue Mail Media has built a strong database of event organizers and associated decision makers to help you meet your marketing objectives in a successful manner. Blue Mail Media’s Event Organizers List is highly reliable and can help you precisely connect with your target market. Our mailing database gives you access to complete marketing information to reach your target customers via telephone, email or mail. We put great efforts in ensuring our database is up-to-date and free of errors, so that you achieve more on your marketing initiatives. Also, we can provide you with pre-packaged as well as customized List of Event Organizers Email Addresses based on your campaign specific requirements. Blue Mail Media has been able to establish a strong network of data partners across USA, UK, Canada, Europe, North America, APAC and other parts of the world. This enables us to serve clients beyond their domestic boundaries in a global yet local way.